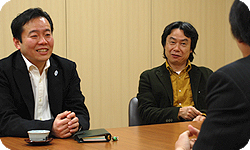 Today, I would like to "ask" three individuals who were in charge of the development of Mario Kart Wii. 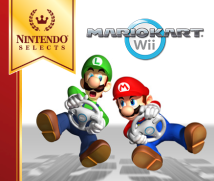 Many Mario Kart games have been released over the years, and this will be the sixth game in the series. Super Mario Kart1, which was the first in the series, went on sale 16 years ago, back in 1992. At the time, even though I was so busy at HAL Laboratory with my work that I could barely go home, I remember going to the store to purchase a copy on the day it was released and then making time to play. Let’s begin with a self-introduction by Konno-san. 1 Super Mario Kart: The first game in the Mario Kart series. Released in Europe in January of 1993 for the Super Nintendo Entertainment System. Hi, I’m Konno from the Entertainment Analysis and Development Division’s Software Development Department. I worked as producer on Mario Kart Wii. Konno-san has been developing games since the days of the original NES, but this is the first time he has appeared in Iwata Asks. It’s hard to believe that you haven’t appeared here before. And then there’s Ashida-san. 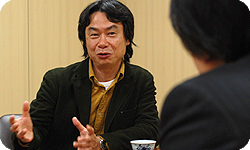 You appeared last time in the Wii hardware session of the Iwata Asks interviews. Right, I’m Ashida from the Product Development Department of the Integrated Research and Development Division. I was the project leader for the Wii Wheel™. Um...my name isn’t on the credits for this one, but is it all right if I join in? Aren’t you listed at the very top as General Producer? When I’m listed as General Producer, it usually means I hardly even opened my mouth to have a say on what went on during the development process. But this time I gave little inputs regarding new aspects of play such as the Wii Wheel and battles over Nintendo Wi-Fi Connection. Konno-san, how long have you been involved with the Mario Kart series? Ever since the first game. I worked on the three games for the Super NES, Nintendo 64 and Nintendo DS. So you didn’t work on the games for the Game Boy Advance and the GameCube? I was around to give advice, but for the most part was not involved in the actual development. What kind of a position did you hold during development of the first game? I worked on it as director along with one other staff member. During the early days of the NES, staff members within Nintendo associated HAL Laboratory with cutting-edge technology and thought of Nintendo as developing its products steadily but surely. But from around the time before we released the Super NES, a lot of brilliant programmers came in to Nintendo and we were able to make games like F-Zero2 on our own. 2 F-Zero: A racing game set in the near future. Released in Europe in June 1992, simultaneously with the Super NES. At HAL Laboratory, we dropped everything to compete in the time trials when F-Zero came out, too. It may be because I was once in charge of developing “F1 Race” (a Formula 1 game) in HAL Laboratory, that I was attracted to these kinds of games. Originally, the development of Super Mario Kart began with the idea of creating a two-player racing game in contrast to the single-person gameplay of F-Zero. Just so there’s no confusion, however, I should point out that we didn’t set out to create a two-player version of F-Zero. We set out to make a game where we could display the game screen for two players at the same time. With more than one player, it would have been impossible to illustrate the high speeds of F-Zero. Why did you decide on using Mario? Well, in the very first prototype, there was a guy in overalls sitting in the kart. Wait just a minute! I can’t let that slip by. Did you just say a guy in overalls? For F-Zero the characters were seven heads tall, but for Super Mario Kart, we decided on three heads tall characters in order to suit the design of the karts. How long was it before Mario himself actually appeared in the karts? It was about three to four months after we started development, when we had created a prototype involving two karts racing simultaneously. Back then, instead of a banana peel as an item, there were little oil cans. If you threw one out, the oil would spill, sending the karts spinning. How did you come to make the race and battle modes? We had decided from the start that there would be races, but we thought that it would be good if the game served as a communication tool in which one-on-one battles were possible via some other kind of gameplay rather than simply competing for rank, and someone had the idea of popping each other’s balloons. Super Mario Kart was being played by people all over the world. When the time came to make a sequel for the Nintendo 64, what did you have in mind? 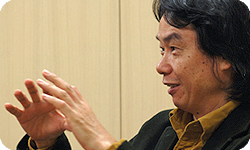 While we were working on Mario Kart 643, Miyamoto-san was busy next door working on Super Mario 644. Like their team, we were hoping to get our game ready for simultaneous release with the game console, but... 3 Mario Kart 64: The second game in the series. Released in Europe in June 1997 for the Nintendo 64. 4 Super Mario 64: A 3-D action game released in Europe in March 1997 simultaneously with the Nintendo 64 game console. But Miyamoto-san left you stranded because he was immersed in Super Mario 64? Did he also take your staff and put them on the Mario 64 team? So we enlisted support from other departments and continued development. The biggest difference from the Super NES game was the 3-D graphics. At the time, I didn’t know much about 3-D imaging, so I had a very hard time. To tell the truth, putting the characters in 3-D isn’t, strictly speaking, impossible, but it slows down the game, and eight characters won’t be able to race all at once. So we first drew images from various angles to be able to show the karts from various angles. Then we put them on boards so they could be animated. The method using the boards is technically known as billboarding. In Super Mario 64, there’s a black ball that appears. That, too, was drawn on a flat board, but no matter which angle you view it from, it always faces the player, so it looks like a sphere. The Bob-ombs and Wigglers were all drawn on these flat billboards. That’s why they look shinier compared to Mario, who was drawn in 3-D polygons. Necessity is the mother of invention. I love solving things like that. Because there wasn’t enough memory, thinking of an economical way to make the movements look right was like solving a puzzle, and I had a lot of fun. The four-player battles in Mario Kart 64 were also made possible with billboarding. At the time, I was more envious of your creativity than admiring it. When the Nintendo 64 came out, Miyamoto-san said that even though the gaming world was heading towards online gaming, we should make games that could be played face-to-face with four of your friends before those days came, and the first four-player game, Mario Kart 64, was released.